Travelling without a return ticket is getting a very bad regular misadventure for me. This trip was no different. I had a plethora of options to choose from for my return trip - but like my outbound, convenience took precedence. 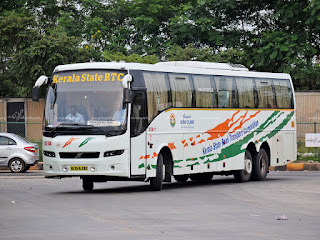 Kerala State RTC's Volvo B9R aka Garuda King Class gave a very big convenience that it would drop me near my home - rather just 6 kms away from home, at Peenya Satellite bus station. I booked my ticket about a week before travel - and I was quite shocked that they were charging end-to-end fares for the bus, and almost half the bus was already sold out. I picked up a seat in the rear half of the bus, and, quite interestingly, booked an end-to-end ticket. I planned to change my boarding point to Thrissur, if needed on the day of my journey. I hadn't realised that I was stuck in Trivandrum, until I saw the crowd at the bus station! I hadn't really realised that I was traveling a day before a long long weekend - a Second Saturday, Sunday, followed by Kerala's "national" festival aka Hartal on Monday, an opportunity to 'fall sick' on Tuesday and Diwali holiday on Wednesday! Essentially a five day, extended weekend! Buses were sold out, while the unreserved ones had people ready to pounce the moment the door opened! I had no option but to stay over that night, and try my luck with early morning buses. 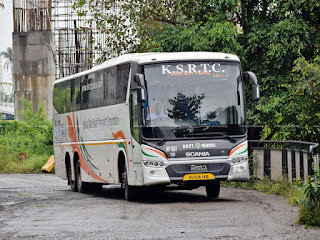 Intuitively, I headed to the reservation website and found that the Scania bus to Coimbatore, leaving Trivandrum at 0400hrs, had 7 seats available - the last two rows! I grabbed one of them quickly - seat #41 was chosen. This was a pre-vacation trip home. I hadn't planned this trip, until a few weeks before I actually travelled. I was to return from home with my brother - and hence, I only had to take care of one way reservations. My travel was coinciding with a four day long weekend in Bengaluru - which means, every migrant in the city travels out. I decided to leave a few days earlier, using the compensatory offs I had accumulated at work. Leaving a couple of days earlier meant I was traveling on a weekday, and I had plenty of options to choose from. 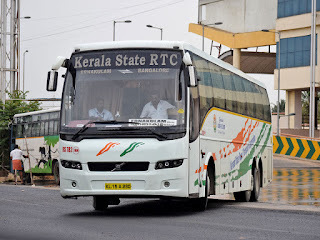 A slightly expensive but convenient Kerala State RTC Volvo or a cheaper Karnataka State RTC Scania! I chose the former since it starts from a bus station very close to my residence, and I am saved of all the inconvenience of having to travel to Shantinagar.